When do the theaters open? * Hours may vary depending on films showing. What does the *** found in front of movie titles mean? The *** refers to a "starred attraction" as we call it on our recordings. It means that due to our licensing agreement with the studio this film is a "no pass engagement" meaning no passes or discount tickets can be accepted. Gift certificates however are always valid. How and where can I buy gift cards? Gift Cards can be a great gift for any occasion. They are good anytime for any movie and never expire. Gift Cards may be used for admissions and concessions at all locations. Movie Gift Cards are a great way to reward employees, thank customers or for any occasion and anyone! They can be purchased at all theatres during regular theatre hours and in the corporate office Monday through Friday, 8:30 am - 4 pm. Give the gift of entertainment, give movie gift cards! Can I rent the theatres? How can I work in the movies? 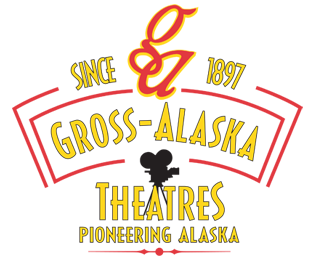 Gross-Alaska is always looking for friendly, hardworking and dependable individuals who enjoy movies and customer service. Click here to download an application and apply today at any of our locations. How much does admission cost? For this reason and for the comfort and enjoyment of all our customers, we will no longer offer child admission rates to “R” rated films and encourage you to not bring children to “R” rated features. We thank you for your understanding and cooperation. If you have any questions regarding this matter, please contact our corporate office at 586-3634. Thank you for your continued patronage and…..Enjoy the show!